It is believed to be the first time an owner’s colours have finished in that order at the meeting. McManus’s Garde Champetre (7/2), ridden by Nina Carberry, carried top weight of 11st 12lb to victory - last year he won the prize under 10st 13lb. 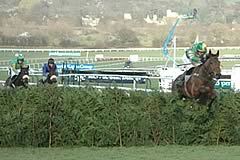 The runner-up was L’Ami (7/4 fav), the mount of JT McNamara, while Drombeag (7/1) took third carrying Robbie Power. It will surprise no one that the trio were saddled by Enda Bolger, the Limerick-based trainer who monopolises cross-country races. Since this event was introduced at the Festival in 2005 Bolger has won four of the five runnings. Only Philip Rothwell has broken his stranglehold, thanks to Native Jack in 2006. In typical style Bolger attributed the victory by Garde Champetre to Carberry, and said: “I’m delighted, but Nina is the factor. She gets on so well with the horse - he’s a different animal when she’s on his back. Asked if he would be celebrating tonight, Bolger said: “We won’t miss it,” and when asked about Garde Champetre’s effort under top weight, he added: “He must have been a certainty last year. We were scared about the weight because he’s not the most robust horse. McManus, 58 today, had earlier seen his Wichita Lineman win the William Hill Trophy Handicap Chase, while Binocular carried his colours into third in the Smurfit Kappa Champion Hurdle. Nina Carberry won the Glenfarclas Cross Country Handicap Steeple Chase over Cheltenham’s unique Cross Country course for the third time aboard Garde Champetre. Carberry was also in the saddle when Garde Champetre won this contest last year and scored aboard Heads Onthe Ground in 2007. Carbbery commented: "He's a great little horse and he absolutely loves this race. I thought L'Ami had me turning in because I gave my fella a squeeze and he wasn't really picking up. I didn't want to help L'Ami coming up the straight so I pulled wide and it helped my lad a bit - it just gave me a chance to get at him without bringing L'Ami on. He did it great. Carbery was enjoying her fourth winner in total at The Festival and remarked: "It gets better as you get older! “It was great to come back and win on this horse again. There was a bit more pressure this year as we were trying to win the race for a second time. Owner J P McManus has enjoyed a great first day to The Festival, with Wichita Lineman winning the William Hill Handicap Chase, while Garde Champetre, L’Ami and Drombeag gave him a fantastic 1-2-3 in the Glenfarclas Cross Country Steeple Chase. Binocular was the one that got away, with the 6/4 favourite finishing a close third in the Smurfit Kappa Champion Hurdle. McManus remarked : "Binocular ran a great race and just found two that were better than him on the day. He's only five and I am sure that he will be back. You couldn't have any complaints because he got the run of the race and there is still much to look forward to. "AP gave Wichita Lineman a great ride but he gives so many horses great rides and he doesn't have to be seen to be so forceful. He makes up their mind for them and gets them concentrating on the job. I think that horses love having AP on board because he teaches them. "It was nice to see all of the horses run well in the Cross Country Chase. I didn't know which of the two, L'Ami and Garde Champetre, to fancy but thankfully the right one won because I had a few quid each way on Garde Champetre. I thought that it was a bet to nothing but the problem is that I didn't have enough on! "Enda lives where I used to live and he's made these races his life. He's given those horses a new lease of life and they have found another vocation. "It's great that Cheltenham have these races and that these horses are not forgotten about. I am very much in favour of them. "Nina has wonderful hands and horses run for her. She's a bit special."